"Ume" redirects here. For other uses, see Ume (disambiguation). "Meihua" redirects here. For the Taiwanese film, see Victory (1976 film). "Green plum" redirects here. For the tree from northern Australia, see Buchanania obovata. Prunus mume is an Asian tree species classified in the Armeniaca section of the genus Prunus subgenus Prunus. Its common names include Chinese plum and Japanese apricot. The flower is usually called plum blossom. This distinct tree species is related to both the plum and apricot trees. Although generally referred to as a sour green plum or just green plum in English, it is more closely related to the apricot and should not be confused with the greengage European plum cultivar. In Chinese, Japanese and Korean cooking, the fruit of the tree is used in juices, as a flavouring for alcohol, as a pickle and in sauces. It is also used in traditional medicine. Prunus mume came from in the south of mainland China around the Yangtze River and was later introduced to Japan, Korea, Taiwan and Vietnam. It can be found in sparse forests, stream sides, forested slopes along trails and mountains, sometimes at altitudes up to 1,700–3,100 metres (5,600–10,200 ft), and regions of cultivation. Prunus mume is a deciduous tree that starts to flower in mid-winter, typically around January until late February in East Asia. It can grow to 4–10 metres (13–33 ft) tall. The flowers are 2–2.5 centimetres (0.79–0.98 in) in diameter and have a strong fragrant scent. They have colors in varying shades of white, pink, and red. The leaves appear shortly after the petals fall, are oval-shaped with a pointed tip, and are 4–8 cm long and 2.5–5 cm wide. The fruit ripens in early summer, around June and July in East Asia, and coincides with the rainy season of East Asia, the meiyu (梅雨, "plum rain"). The drupe is 2–3 centimetres (0.79–1.18 in) in diameter with a groove running from the stalk to the tip. The skin turns yellow, sometimes with a red blush, as it ripens, and the flesh becomes yellow. The tree is cultivated for its fruit and flowers. The plant is known by a number of different names in English, including Chinese plum and Japanese apricot. An alternative name is ume, from Japanese, or mume, from the scientific name. Another alternative name is mei, from the Chinese name. The flower is known as the meihua (梅花) in Chinese, which came to be translated as "plum blossom" or sometimes as "flowering plum". The term "winter plum" may be used too, specifically with regard to the depiction of the flower with its early blooming in Chinese painting. In Chinese it is called mei (梅) and the fruit is called meizi (梅子). The Japanese name is ume (kanji: 梅; hiragana: うめ), while the Korean name is maesil (hangul: 매실; hanja: 梅實). The Japanese and Korean terms derive from Middle Chinese, in which the pronunciation is thought to have been muəi. The Vietnamese name is mai or mơ (although mai vàng refers to a different plant, Ochna integerrima, in southern Vietnam). Ornamental tree varieties and cultivars of P. mume have been cultivated for planting in various gardens throughout East Asia, and for cut blossoming branches used in flower arrangements. It is disputed whether Prunus zhengheensis (Chinese: 政和杏) is a separate species or conspecific with Prunus mume. It is found in the Fujian province of China. It is only known from one county, Zhenghe. It is a tree 35 to 40 m tall, preferring to grow at 700 to 1000 m above sea level. The yellow fruit is delectable. In Japan, ornamental Prunus mume cultivars are classified into yabai (wild), hibai (red), and bungo (Bungo Province) types. The bungo trees are also grown for fruit and are hybrids between Prunus mume and apricot. The hibai trees have red heartwood and most of them have red flowers. The yabai trees are also used as grafting stock. In mainland China and Taiwan, suanmeitang (酸梅汤/酸梅湯; "sour plum juice") is made from smoked plums, called wumei (乌梅/烏梅). The plum juice is extracted by boiling smoked plums in water and sweetened with sugar to make suanmeitang. It ranges from light pinkish-orange to purplish black in colour and often has a smoky and slightly salty taste. It is traditionally flavoured with sweet osmanthus flowers, and is enjoyed chilled, usually in summer. In Korea, both the flowers and the fruits are used to make tea. Maehwa-cha (매화차, 梅花茶; "plum blossom tea") is made by infusing the flowers in hot water. Maesil-cha (매실차, 梅實茶; "plum tea") is made by mixing water with maesil-cheong (plum syrup) and is served either hot or cold. In Japan, similar drink made from green plums, tastes sweet and tangy, is considered a cold, refreshing drink and is often enjoyed in the summer. A thick, sweet Chinese sauce called meijiang (梅酱) or meizijiang (梅子酱), usually translated as "plum sauce", is also made from the plums, along with other ingredients such as sugar, vinegar, salt, ginger, chili, and garlic. Similar to duck sauce, it is used as a condiment for various Chinese dishes, including poultry dishes and egg rolls. In Korea, maesil-cheong (매실청, 梅實淸, "plum syrup"), an anti-microbial syrup made by sugaring ripe plums, is used as a condiment and sugar substitute. It can be made by simply mixing plums and sugar together, and then leaving them for about 100 days. To make syrup, the ratio of sugar to plum should be at least 1:1 to prevent fermentation, by which the liquid may turn into plum wine. The plums can be removed after 100 days, and the syrup can be consumed right away, or mature for a year or more. In Korea, hwajeon (화전, 花煎; "flower pancake") can be made with plum blossoms. Called maehwa-jeon (매화전, 梅花煎; "plum blossom pancake"), the pancake dish is usually sweet, with honey as an ingredient. Plum liquor, also known as plum wine, is popular in both Japan and Korea, and is also produced in China. Umeshu (梅酒; "plum wine") is a Japanese alcoholic drink made by steeping green plums in shōchū (clear liquor). It is sweet and smooth. A similar liquor in Korea, called maesil-ju (매실주, 梅實酒; "plum wine"), is marketed under various brand names, including Mae hwa soo, Matchsoon and Seoljungmae. Both the Japanese and Korean varieties of plum liquor are available with whole plum fruits contained in the bottle. In China, plum wine is called méijiǔ (梅酒). In Taiwan, a popular 1950s innovation over the Japanese-style plum wine is the wumeijiu (烏梅酒; "smoked plum liquor"), which is made by mixing two types of plum liquor, meijiu (梅酒) made of P. mume and lijiu (李酒) made of P. salicina, and oolong tea liquor. In Vietnam, ripe plums are macerated in sticky rice liquor. The resulting liquor is called rượu mơ. A brand selling plum liquor is Sơn Tinh. In Chinese cuisine, plums pickled with vinegar and salt are called suanmeizi (酸梅子; "sour plum fruits"), and have an intensely sour and salty flavour. They are generally made from unripe plum fruits. Huamei (话梅) are Chinese preserved plums and refers to Chinese plums pickled in sugar, salt, and herbs. There are two general varieties: a dried variety, and a wet (pickled) variety. Umeboshi (梅干) are pickled and dried plums. They are a Japanese specialty. Pickled with coarse salt, they are quite salty and sour, and therefore eaten sparingly. They are often red in colour when purple shiso leaves are used. Plums used for making umeboshi are harvested in late May or early June, while they are still green, and layered with salt. They are weighed down with a heavy stone (or some more modern implement) until late August. They are then dried in the sun on bamboo mats for several days (they are returned to the salt at night). The flavonoid pigment in shiso leaves gives them their distinctive colour and a richer flavour. Umeboshi are generally eaten with rice as part of a bento (boxed lunch), although they may also be used in makizushi (rolled sushi). Umeboshi are also used as a popular filling for rice balls (onigiri) wrapped in laver. Makizushi made with plums may be made with either umeboshi or bainiku (umeboshi paste), often in conjunction with green shiso leaves. A byproduct of umeboshi production is umeboshi vinegar, a salty, sour condiment. In Korea, there is a 'Massil-jangajji' similar to 'Umeboshi'. It is a common side dish in Korea. In the middle of June, select a slightly yellowish plum just before its maturation during the rainy season, wash it thoroughly with water, and lift it in a basket to pick the top. Place a bowl of dried plums on a platter and sprinkle 2 percent salt on the plums, then gently press the top with a stone, close the lid, and store in a cool place where the sun is not peppered. Remove the tea leaves from mid-June to July, wash them clean, then sprinkle them with about 3 percent salt, remove the green water twice, mash it well and mix it with pickled plum, then gently press the lid with a vinyl and put it in a cool place. A very similar variety of pickled plum, xí muội or ô mai is used in Vietnamese cuisine. The best fruit for this are from the forest around the Hương Pagoda in Hà Tây Province. Prunus mume is a common fruit in Asia and used in traditional Chinese medicine. It has long been used as a traditional drug and healthy food in East Asian countries. A recent study has indicated that Prunus mume extract is a potential candidate for developing an oral antimicrobial agent to control or prevent dental diseases associated with several oral pathogenic bacteria. Recent studies have also shown that Prunus mume extract may inhibit Helicobacter pylori, associated with gastritis and gastric ulcers. Experiments on rats suggest that P. mume extract administered during endurance exercise training may enhance the oxidative capacity of exercising skeletal muscle, and may induce the muscle to prefer fatty acids for its fuel use rather than amino acids or carbohydrates, thus assisting endurance. The plum blossom, which is known as the meihua (梅花), is one of the most beloved flowers in China and has been frequently depicted in Chinese art and poetry for centuries. The plum blossom is seen as a symbol of winter and a harbinger of spring. The blossoms are so beloved because they are viewed as blooming most vibrantly amidst the winter snow, exuding an ethereal elegance, while their fragrance is noticed to still subtly pervade the air at even the coldest times of the year. Therefore, the plum blossom came to symbolize perseverance and hope, as well as beauty, purity, and the transitoriness of life. In Confucianism, the plum blossom stands for the principles and values of virtue. More recently, it has also been used as a metaphor to symbolize revolutionary struggle since the turn of the 20th century. Because it blossoms in the cold winter, the plum blossom is regarded as one of the "Three Friends of Winter", along with pine, and bamboo. The plum blossom is also regarded as one of the "Four Gentlemen" of flowers in Chinese art together with the orchid, chrysanthemum, and bamboo. It is one of the "Flowers of the Four Seasons", which consist of the orchid (spring), the lotus (summer), the chrysanthemum (autumn) and the plum blossom (winter). These groupings are seen repeatedly in the Chinese aesthetic of art, painting, literature, and garden design. encroaching on the charms of smaller gardens. their subtle scent pervades the moonlit dusk. butterflies would faint if they but knew. I don't need a sounding board or winecup. As with the literary culture amongst the educated of the time, Lin Bu's poems were discussed in several Song dynasty era commentaries on poetry. Wang Junqing remarked after quoting the third and fourth line: "This is from Lin Hejing's [Lin Bu's] plum blossom poem. Yet these lines might just as well be applied to the flowering apricot, peach, or pear. "—a comparison of the flowers with the plum blossom to which the renowned Song dynasty poet Su Dongpo (蘇東坡) replied, "Well, yes, they might. But I'm afraid the flowers of those other trees wouldn't presume to accept such praise." Plum blossoms inspired many people of the era. Legend has it that once on the 7th day of the 1st lunar month, while Princess Shouyang (壽陽公主), daughter of Emperor Wu of Liu Song (劉宋武帝), was resting under the eaves of Hanzhang Palace near the plum trees after wandering in the gardens, a plum blossom drifted down onto her fair face, leaving a floral imprint on her forehead that enhanced her beauty further. The court ladies were said to be so impressed that they started decorating their own foreheads with a small delicate plum blossom design. This is also the mythical origin of the floral fashion, meihua zhuang (梅花妝; literally "plum blossom makeup"), that originated in the Southern Dynasties (420–589) and became popular amongst ladies in the Tang (618–907) and Song (960–1279) dynasties. The markings of plum blossom designs on the foreheads of court ladies were usually made with paintlike materials such as sorghum powder, gold powder, paper, jade and other tint substances. Princess Shouyang is celebrated as the goddess of the plum blossom in Chinese culture. During the Ming dynasty (1368–1644), the garden designer Ji Cheng wrote his definitive garden architecture monograph Yuanye and in it he described the plum tree as the "beautiful woman of the forest and moon". The appreciation of nature at night plays an important role in Chinese gardens, for this reason there are classical pavilions for the tradition of viewing plum blossoms by the moonlight. The flowers are viewed and enjoyed by many as annual plum blossom festivals take place in the blooming seasons of the meihua. The festivals take place throughout China (for example, West Lake in Hangzhou and scenic spots near Zijin Mountain in Nanjing amongst other places). Plum blossoms are often used as decoration during the Spring Festival (Chinese New Year) and remain popular in the miniature gardening plants of the art penjing. Branches of plum blossoms are often arranged in porcelain or ceramic vases, such as the meiping (literally "plum vase"). These vases can hold single branches of plum blossoms and are traditionally used to display the blossoms in a home since the early Song dynasty (960–1279). The Moy Yat lineage of Wing Chun kung fu uses a red plum flower blossom as its symbol. The plum blossoms are featured on one of the four flowers that appear on mahjong tile sets, where mei (梅) is usually simply translated as "plum" in English. 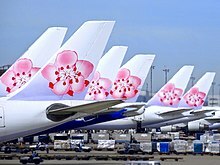 Plum blossoms pained on China Airlines aircraft tails. The National Flower of the Republic of China (Taiwan) was officially designated as the plum blossom (Prunus Mei; Chinese: 梅花) by the Executive Yuan of the Republic of China on July 21, 1964. The plum blossom is symbol for resilience and perseverance in the face of adversity during the harsh winter. The triple grouping of stamens (three stamens per petal) on the national emblem represents Sun Yat-sen's Three Principles of the People, while the five petals symbolize the five branches of the government. It also serves as the logo of China Airlines, the national carrier of Taiwan (the Republic of China). The flower is featured on some New Taiwan dollar coins. In Korea, the plum blossom is a symbol for spring. It is a popular flower motif, amongst other flowers, for Korean embroidery. Maebyong are plum vases derived from the Chinese meiping and are traditionally used to hold branches of plum blossoms in Korea. Plum blossoms are often mentioned in Japanese poetry as a symbol of spring. When used in haiku or renga, they are a kigo or season word for early spring. The blossoms are associated with the Japanese bush warbler and depicted together on one of the twelve suits of hanafuda (Japanese playing cards). Plum blossoms were favored during the Nara period (710–794) until the emergence of the Heian period (794–1185) in which the cherry blossom was preferred. Japanese tradition holds that the ume functions as a protective charm against evil, so the ume is traditionally planted in the northeast of the garden, the direction from which evil is believed to come. The eating of the pickled fruit for breakfast is also supposed to stave off misfortune. In Vietnam, due to the beauty of the tree and its flowers, the word mai is used to name girls. The largest hospital in Hanoi is named Bạch Mai (white plum blossom), another hospital in Hanoi is named Mai Hương ("the scent of plum"), situated in Hong Mai (pink plum blossom) street. Hoàng Mai (yellow plum blossom) is the name of a district in Hanoi. Bạch Mai is also a long and old street in Hanoi. All these places are located in the south part of Hanoi, where, in the past, many P. mume trees were grown. ^ a b c d e f "Prunus mume (mume)". Royal Botanic Gardens, Kew. Archived from the original on November 9, 2011. Retrieved August 9, 2011. ^ Tan, Hugh T.W. ; Giam, Xingli (2008). Plant magic: auspicious and inauspicious plants from around the world. Singapore: Marshall Cavendish Editions. p. 142. ISBN 9789812614278. ^ Kuitert, Wybe; Peterse, Arie (1999). Japanese flowering cherries. Portland: Timber Press. p. 42. ISBN 9780881924688. ^ Fan, Chengda (2010). Treatises of the Supervisor and Guardian of the Cinnamon Sea (Translated ed.). Seattle: University of Washington Press. p. LV. ISBN 9780295990798. ^ Smith, Kim (2009). Oh garden of fresh possibilities!. New Hampshire: David R. Godine, Publisher. p. 38. ISBN 978-1-56792-330-8. ^ "Gardening". The Garden. 112: 224. 1987. ^ a b Fang, J; Twito, T; Zhang, Z; Chao, CT (October 2006). "Genetic relationships among fruiting-mei (Prunus mume Sieb. et Zucc.) cultivars evaluated with AFLP and SNP markers". Genome / National Research Council Canada = Genome / Conseil National de Recherches Canada. 49 (10): 1256–64. doi:10.1139/g06-097. PMID 17213907. ^ a b c d e f "Armeniaca mume in Flora of China". eFloras. Missouri Botanical Garden (St. Louis, MO) & Harvard University Herbaria (Cambridge, MA). Retrieved 21 August 2011. ^ Wessel, Mark. "Prunus mume: A bridge between winter and spring". Retrieved 21 August 2011. ^ Herbert Edgar, Wright (1993). Global climates since the last glacial maximum. Minneapolis: University of Minnesota Press. p. 251. ISBN 978-0-8166-2145-3. ^ a b c Kilpatrick, Jane (2007). Gifts from the Gardens of China. London: Frances Lincoln Ltd. pp. 16–17. ISBN 978-0-7112-2630-2. ^ a b c d e f Patricia Bjaaland Welch (2008). Chinese art: a guide to motifs and visual imagery. North Clarendon: Tuttle Publishing. pp. 38–9. ISBN 978-0-8048-3864-1. ^ a b "梅和梅的品种". Science Museums of China. Chinese Academy of Sciences. Retrieved 28 August 2011. ^ Tong, Yihua; Xia, Nianhe (2016). "New combinations of Rosaceae, Urticaceae and Fagaceae from China" (PDF). Biodiversity Science. 24 (6): 714–718. doi:10.17520/biods.2016071. Retrieved 18 September 2018. ^ 王, 家琼; 吴, 保欢; 崔, 大方; 羊, 海军; 黄, 峥; 齐, 安民 (14 November 2016). "Taxonomic study on Armeniaca Scop. species in China based on thirty morphological characters". 植物资源与环境学报. 2016 (03): 103–111. Retrieved 18 September 2018. ^ a b Khan, Ikhlas A.; Abourashed, Ehab A. (2008). Leung's encyclopedia of common natural ingredients: used in food, drugs, and cosmetics (3rd ed.). Hoboken, N.J.: Wiley. ISBN 978-0-471-46743-4. ^ a b Baek, Jong-hyun (23 April 2016). "A taste of Korea with three regional delights". Korea JoongAng Daily. Retrieved 17 December 2016. ^ Han, Dongha (1 June 2016). "청(淸)과 발효액은 어떻게 다를까?" [What's the difference between cheong(syrup) and fermented liquor?]. Kyunghyang Shinmun (in Korean). Retrieved 18 December 2016. ^ a b Seneviratne, CJ; Wong, RW; Hägg, U; Chen, Y; Herath, TD; Samaranayake, PL; Kao, R (July 2011). "Prunus mume extract exhibits antimicrobial activity against pathogenic oral bacteria". International Journal of Paediatric Dentistry. 21 (4): 299–305. doi:10.1111/j.1365-263X.2011.01123.x. PMID 21401748. ^ Liu, Zhanwen; Liu, Liang (2009). Essentials of Chinese medicine. New York: Springer. p. 273. ISBN 978-1-84882-111-8. ^ Jung, BG; Ko, JH; Cho, SJ; Koh, HB; Yoon, SR; Han, DU; Lee, BJ (September 2010). "Immune-enhancing effect of fermented Maesil (Prunus mume Siebold & Zucc.) with probiotics against Bordetella bronchiseptica in mice". The Journal of Veterinary Medical Science / the Japanese Society of Veterinary Science. 72 (9): 1195–202. doi:10.1292/jvms.09-0555. PMID 20453453. ^ Miyazawa, M; Utsunomiya, H; Inada, K; Yamada, T; Okuno, Y; Tanaka, H; Tatematsu, M (January 2006). "Inhibition of Helicobacter pylori motility by (+)-Syringaresinol from unripe Japanese apricot". Biological & Pharmaceutical Bulletin. 29 (1): 172–3. doi:10.1248/bpb.29.172. PMID 16394533. ^ Enomoto, S; Yanaoka, K; Utsunomiya, H; Niwa, T; Inada, K; Deguchi, H; Ueda, K; Mukoubayashi, C; Inoue, I; Maekita, T; Nakazawa, K; Iguchi, M; Arii, K; Tamai, H; Yoshimura, N; Fujishiro, M; Oka, M; Ichinose, M (July 2010). "Inhibitory effects of Japanese apricot (Prunus mume Siebold et Zucc. ; Ume) on Helicobacter pylori-related chronic gastritis". European Journal of Clinical Nutrition. 64 (7): 714–9. doi:10.1038/ejcn.2010.70. PMID 20517325. ^ Soyoung Kim, Sung-Hee Park, Hye-Nam Lee, Taesun Park. "Prunus mume Extract Ameliorates Exercise-Induced Fatigue in Trained Rats", Journal of Medicinal Food. September 2008: 460-468. ^ a b "The Three Friends of Winter: Paintings of Pine, Plum, and Bamboo from the Museum Collection (Introduction)". National Palace Museum. January 2003. Retrieved 10 August 2011. ^ a b Cai, Zong-qi (2008). How to read Chinese poetry: A guided anthology. New York: Columbia University Press. pp. 210–311. ISBN 978-0-231-13941-0. ^ Bartók, Mira; Ronan, Christine (1994). Ancient China. Good Year Books. p. 13. ISBN 978-0-673-36180-6. ^ Ip, Hung-yok (2005). Intellectuals in revolutionary China, 1921-1949: leaders, heroes and sophisticates. Oxfordshire: Routledge. pp. 103, 110. ISBN 978-0-415-35165-2. ^ a b c Heinrich, Sally (2007). Key into China. Curriculum Press. pp. 28, 80. ISBN 978-1-86366-697-8. ^ Forsyth, Holly (2010). Gardens of Eden: Among the World's Most Beautiful Gardens. The Miegunyah Press. p. 104. ISBN 9780522857764. ^ China Travel Guide. "Gu Shan (Solitary Hill)". Retrieved 9 August 2011. ^ Schmidt, Jerry Dean (2003). Harmony Garden: the life, literary criticism, and poetry of Yuan Mei (1716-1799). London: Routledge. p. 641. ISBN 978-0-7007-1525-1. ^ Red Pine. Poems of the Masters. Port Townsend, Copper Canyon Press, 2003, p.453. ^ a b Dudbridge, Glen; Berg, Daria (2007). Reading China. Leiden: Brill. pp. 56–58. ISBN 978-90-04-15483-4. ^ a b c d Wang, Betty. "Flower deities mark the lunar months with stories of Love & Tragedy". Taiwan Review. Government Information Office, Republic of China. Archived from the original on 25 May 2012. Retrieved 20 November 2011. ^ a b "Taiwan periodicals_West & East". West & East 中美月刊. 36-37: 9. 1991. ISSN 0043-3047. ^ a b Huo, Jianying. "Ancient Cosmetology". China Today. Archived from the original on 9 May 2012. Retrieved 8 October 2011. ^ Mei, Hua (2011). Chinese clothing. Cambridge: Cambridge University Press. p. 32. ISBN 978-0-521-18689-6. For example, the Huadian or forehead decoration was said to have originated in the South Dynasty, when the Shouyang Princess was taking a walk in the palace in early spring and a light breeze brought a plum blossom onto her forehead. The plum blossom for some reason could not be washed off or removed in any way. Fortunately, it looked beautiful on her, and all of a sudden became all the rage among the girls of the commoners. It is therefore called the "Shouyang makeup" or the "plum blossom makeup." This makeup was popular among women for a long time in the Tang and Song Dynasties. ^ Int'l Plum Blossom Festival draws crowds in Nanjing. Retrieved 9 August 2011. ^ Harper, Damian; Fallon, Steve (2005). China. Lonely Planet. p. 228. ^ Patricia Bjaaland Welch (2008). Chinese art: a guide to motifs and visual imagery. North Clarendon: Tuttle Publishing. p. 17. ISBN 978-0-8048-3864-1. ^ Hansman, John (1985). Julfār, an Arabian port: Its settlement and Far Eastern ceramic trade from the 14th to the 18th centuries. London: Royal Asiatic Society of Great Britain and Ireland. p. 28. ISBN 978-0-947593-01-8. ^ "meiping". Encyclopædia Britannica. Retrieved 17 August 2011. ^ "Prunus Vase (meiping)". Saint Louis Art Museum. Retrieved 17 August 2011. ^ "Meiping". Musée Guimet. Archived from the original on 30 September 2011. Retrieved 18 August 2011. ^ Lo, Amy (2001). The book of mahjong: An illustrated guide. Boston: Tuttle Publishing. pp. 47–48. ISBN 978-0-8048-3302-8. ^ a b Government Information Office, Republic of China - National Flower Archived 2011-08-05 at the Wayback Machine. Retrieved 9 August 2011. ^ "The Three Friends of Winter: Paintings of Pine, Plum, and Bamboo from the Museum Collection". Taipei: National Palace Museum (國立故宮博物院). January 2003. Retrieved 31 July 2011. ^ a b National Flag, Anthem and Flower[permanent dead link]. Retrieved 9 August 2011. ^ "Looking back". China Airlines. Archived from the original on 17 August 2011. Retrieved 21 August 2011. ^ "Current New Taiwan Dollar Coins". New Taipei City Government. Archived from the original on 31 March 2012. Retrieved 21 August 2011. ^ Mullany, Francis (2006). Symbolism in Korean ink brush painting. Folkestone: Global Oriental. p. 18. ISBN 978-1-901903-89-8. ^ Lee, Kyung-ja; Hong, Na-young; Chang, Sook-hwan (2007). Traditional Korean costume. Folkestone, Kent, UK: Global Oriental. p. 125. ISBN 978-1-905246-04-5. ^ "Vase (Maebyeong) with Lotus Blossoms". Philadelphia Museum of Art. Retrieved 22 August 2011. ^ Smith, Judith G. (1998). Arts of Korea. New York: Metropolitan Museum of Art. p. 415. ISBN 978-0-87099-850-8. ^ Nakamura, Shigeki (2009). Pattern sourcebook: Nature 2: 250 patterns for projects and designs (1. publ. ed.). Beverly, Mass. : Rockport Publishing. ISBN 978-1-59253-559-0. ^ Parker, Mary S. (1999). Sashiko: Easy & elegant Japanese designs for decorative machine embroidery. Asheville, N.C.: Lark Books. p. 132. ISBN 978-1-57990-132-5. ^ Rowthorn, Chris and Florence, Mason. Lonely Planet: Kyoto. 2001, page 21. ^ "Bach Mai - Trang chủ". Bach Mai Hospital. Retrieved 27 August 2011. ^ "Mai Huong Hospital". Mai Huong Day Psychiatric Hospital. Archived from the original on 26 July 2011. Retrieved 27 August 2011. Wikimedia Commons has media related to Prunus mume.